Bananas were introduced to Africa by Arabian traders and discovered there in 1482 A.D. by Portuguese explorers who took them to the Americas. Until rapid transport and storage technologies were implemented, they were not widely available, however. Today, bananas grow in most tropical and subtropical regions—the main commercial exporters are Costa Rica, Mexico, Ecuador and Brazil; they are available worldwide and at all times of the year. Creamy, rich, and sweet, bananas are a favourite food for everyone from infants to elders. Sports enthusiasts appreciate the potassium-power delivered by this high-energy fruit. Since the average banana contains a whopping 467 mg of potassium and only 1 mg of sodium, bananas may help to prevent high blood pressure and protect against certain forms of heart disease. In addition to cardiovascular benefits, the potassium found in bananas may also help to promote bone health. Potassium may counteract the increased calcium loss caused by the high-salt diets typical of most people, helping to prevent bones from thinning out at a fast rate. Bananas with a greener colour will take longer to ripen than those that are more yellow. Bananas should be firm, but not too hard, bright in appearance, and free from bruises or other injuries. Their stems and tips should be intact. The size of the banana does not affect its quality, so simply choose the size that best meets your needs. Bananas should be left to ripen at room temperature and should not be subjected to overly hot or cold temperatures. 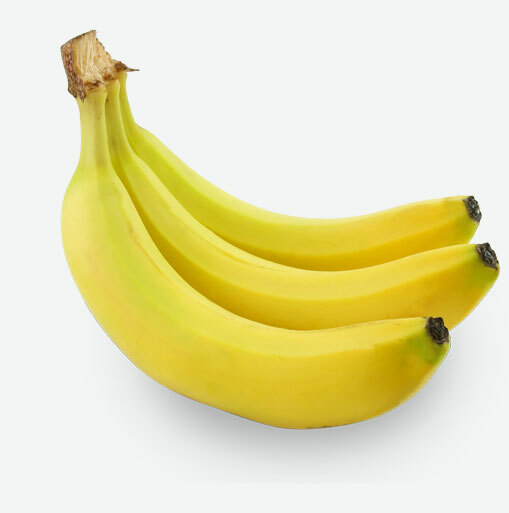 Unripe bananas cannot not be placed in the refrigerator as this will interrupt the ripening process to such an extent that it will not be able to resume even if the bananas are returned to room temperature. If you need to speed up the ripening process, you can place bananas in a paper bag or wrap them in newspaper, adding an apple to accelerate the process. Ripe bananas that will not be consumed for a few days can be placed in the refrigerator. While their peel may darken, the flesh will not be affected. Prior to consuming refrigerated bananas, for maximum flavour, remove them from the refrigerator and allow them to come back to room temperature. In addition to being eaten raw, bananas are a wonderful addition to a variety of recipes from salads to baked goods. A peanut butter and banana sandwich drizzled with maple syrup or honey is an all-time favourite comfort food for children and adults alike. Add chopped bananas, walnuts and maple syrup to oatmeal or porridge. Slice these delicious fruits into fruit salads.